How much do eyebrow transplants cost? Are there any problems that can occur? The entire eyebrow transplant procedure — from initial consultation to full recovery — takes about a year. The procedure itself is typically completed within three to four hours. Because the eyebrow transplant procedure is non-invasive, you will be able to drive yourself home and return to your normal activities within a day or two. The primary difference between microblading and an eyebrow transplant is that microblading is semi-permanent, lasting only 6 to 18 months with proper aftercare. Many patients are interested in transplants as a way to reinvigorate the growth of eyebrow hair that has been significantly altered after years of plucking. Although originally intended to restore eyebrow growth in patients who had lost hair resulting from genetics or as a side effect of chemotherapy, transplants have recently picked up steam in both medical and cosmetic applications. The entire eyebrow transplant procedure — from initial consultation to full recovery — takes about a year. The procedure itself is typically completed within three to four hours. For your initial consultation, bring in a photograph to show your doctor exactly how you would like your new eyebrows to look. Taking into consideration fullness, symmetry and the natural shape of your existing brows. Your doctor will then typically use a surgical marker to draw in the eyebrows to provide you with a better idea of what they’ll ultimately look like. Some doctors might even have software to help you visualize the result beforehand. On the day of treatment, your doctor will administer local anesthesia so that you only feel minimal pain. During the procedure, they will use your own hair follicles (typically taken from an inconspicuous area – like the back of the scalp) in order to harvest individual follicular grafts, which are then meticulously placed, one-by-one, onto the eyebrow area. While grafting hair follicles from the scalp, your doctor may use saline injections to expand the skin in order to to facilitate follicle removal. Depending on what your doctor recommends, one of two traditional hair transplant procedures will be used: either Follicular Unit Extraction (FUE) or Follicular Unit Transplant (FUT). Post-procedure, patients should experience a relatively simple healing process, with doctors often comparing the recovery time to that of getting a tattoo. You may experience some mild superficial bruising and/or crusting on the skin surrounding your eyebrows, but most patients report feeling completely normal just three days after their surgery. Because the eyebrow transplant procedure is non-invasive — generally requiring only local anesthesia — you will be able to drive yourself home and return to your normal activities within a day or two. Doctors warn that some bruising is normal and caution against touching the eyebrows for at least 24 hours following the transplant. In addition, you’ll be told not to get your eyebrows wet and may be asked to limit your use of makeup for several days. Although recovery is pretty quick when compared to more in-depth hair transplant procedures, it still takes approximately four months for new eyebrow hair to grow, with maximum growth reaching its peak in roughly one year’s time. This is because the hair strands placed in your new eyebrows are meant to fall out in order to encourage new growth via the transplanted hair follicles. Before it can do this, however, your hair needs to go through its regular growing-and-shedding cycle. You may want to invest in a pair of trimming shears, as the eyebrow hair will likely grow more quickly than you’d expect. As with any cosmetic procedure, the answer varies based on your exact needs and the location where the procedure is performed. However, due to its time-consuming nature, which requires doctors to remove and apply follicles one-by-one, the average cost is $7500. That said, it can sometimes be less expensive, especially if fewer hair follicles are required to achieve the ideal result. 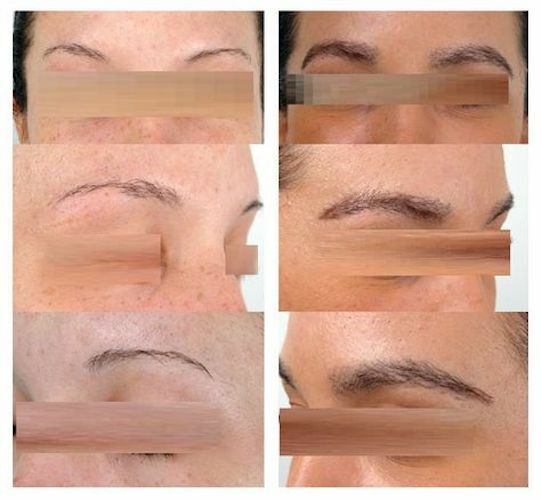 Even so, eyebrow transplants are by far the costliest of the industry’s most-recommended eyebrow enhancement techniques, sometimes several thousand dollars more than popular alternative procedures like permanent makeup and microblading. Although eyebrow transplants are generally considered safe — largely because they implement the same time-honored procedures used in traditional hair transplants — there are still some issues to watch out for. As with any procedure, there are a few risks associated with local anesthesia and saline injections (primarily allergic reactions) that you should be aware of. There is also a slight but not impossible risk of infection caused by grafting and, immediately following the procedure, you may experience slight bruising and scabbing in the eyebrow region. Overall, though, the risk of experiencing any serious complications resulting from eyebrow transplants are extremely slim. However, there are some cosmetic issues that may occur as a result of the transplant. As the new follicles are taken from the scalp area, where there is a higher and faster rate of hair growth, many patients express concern that their eyebrows will become unruly, with rogue hairs growing in the wrong direction, requiring constant maintenance. While a legitimate concern, specialists attest that no more than 15 percent of the new hair will grow in the wrong direction and that it can easily be plucked or trimmed every few months. Some doctors may opt to use finer hair from the leg or body in order to avoid this issue. Weighing your options? If you’re looking for a long-term eyebrow boost then you’ll no doubt want to consider microblading. Rather than implanting hair follicles, microblading — also known as “eyebrow embroidery” or “micro-stroking” — uses permanent makeup to create the appearance of a fuller eyebrow. Although this treatment has grown in popularity over the past few years, it’s actually an age-old technique; with some scholars claiming it’s been in existence for centuries. With microblading, a specialist will insert pigments into the top layer of the skin using a hand-held tool with attached needles (similar to a tattoo gun) in order to fill in areas of the brow where hair is thin or missing. The specialist will take great care to ensure that each hair is drawn on to mimic the look of real hair, with careful attention paid to dimension and shadowing. The primary difference between microblading and an eyebrow transplant is that microblading is semi-permanent, lasting only 6 to 18 months with proper aftercare. Microblading is also significantly more affordable than an eyebrow transplant, costing between $400 and $800 for a complete treatment. However, because microblading uses cosmetic tattoo pigments and transplants use actual follicles, you’re more likely to achieve a more natural result with a transplant. Choosing the procedure that is right for you will depend on a variety of factors, including your preferred end result. In cases where the eyebrow is already full but requires more shaping, specialists will often recommend microblading. If you want a more natural look with the option to shape and color the brows as you please, your doctor will most likely recommend a transplant. Keeping your eyebrows in a beautiful and healthy condition can be a challenge. These brow enhancement products will allow you to easily maintain their length, thickness, and shape. Filled with vitamins and botanicals, Joey Healy’s Brow Renovation Serum is a must-have product to enhance the appearance of full and healthy eyebrows. The results are visible in as little as three weeks. The serum is also free of parabens and fragrance, which reduces the risk of causing skin sensitivity. 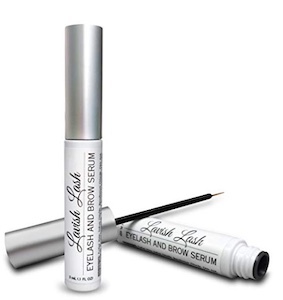 Lavish Lash provides a revolutionary botanical serum to boost the length and thickness of both eyelashes and eyebrows. Results can be seen in as little as 60 days — say goodbye to false lashes and eyebrow pencils! 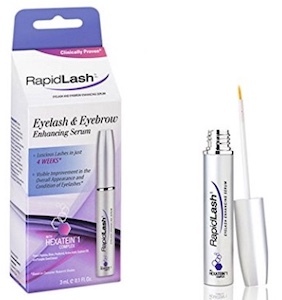 The multitasking RapidLash enhances both the eyelashes and eyebrows, making them more lush and beautiful. It’s safe to apply around the eyes for those who wear contact lenses. Moreover, the product is free of parabens and fragrance. The Talika Eyebrow Lipocils Eyebrow Conditioning Gel is clinically proven to stimulate hair growth in 28 days. For the best results, gently apply on the eyebrows after waking up and before going to sleep, at least two to three times a week.